In the Klinger Lab, we are inspired by nature's ability to simultaneously control spatial relationships between internal morphology, overall shape, and chemical functionality in a single nanoscopic system. 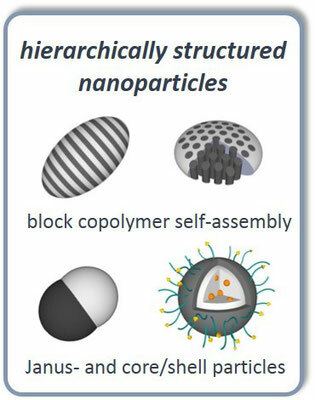 To approach such a level of control in synthetic polymeric systems, we follow a hierarchical design concept that combines the development of new responsive polymers with polymeric self-assembly, colloidal chemistry, and interfacial physics (see Figure below). 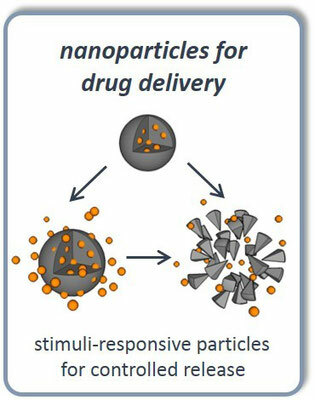 The development of such artificial nano-materials will serve as building blocks for advanced technologies such as photonics, drug delivery, catalysis and lithography. Figure 1. A hierarchical pathway to functional nano-materials. 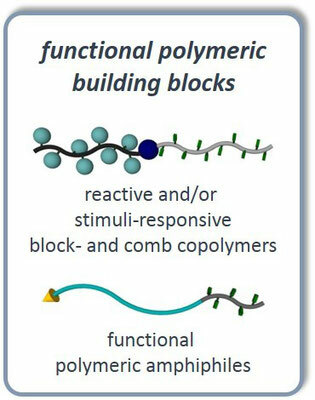 The starting point for tailoring the properties of polymeric (nano-)materials is the development of (macro)molecular building blocks. Key to a successful material design is to understand that the macroscopic behavior is the result of highly cooperative interactions - small chemical, conformational or architectural changes in a polymeric structure are able to induce a comparably huge response at the macroscopic level. Being able to precisely control these parameters is the foundation of our research. In the Klinger Lab, we transfer concepts and methodologies from synthetic organic chemistry to polymeric materials. Developing new functional groups and reactions that are inspired by small molecules and incorporating these into polymeric backbones or side chains opens up new and exciting pathways for the development of dynamic and responsive polymeric architectures. Following a hierarchical approach, controlling the structure of these materials in the nano- or micrometer size range allows for the introduction of a second level of functionality. Tuning the morphology – and thereby the spatial distribution of responsive chemical groups - in a nano-material gives access to unique structural properties. 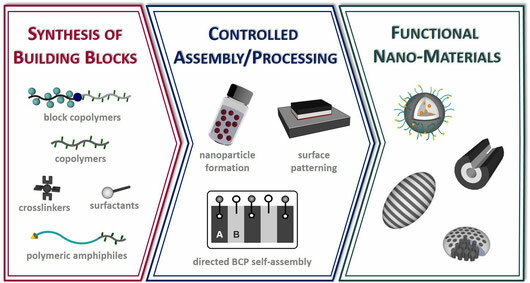 A very promising modular approach to this challenge is the self-assembly of functional block copolymers (BCP) in spatial confinements such as nanoparticles and thin films. Developing new methods to control the self-organization of functional macromolecules via the polymer/water interface not only allows gaining fundamental insights into the physics of these interfaces but also enables facile access to a multitude of nanostructured materials. 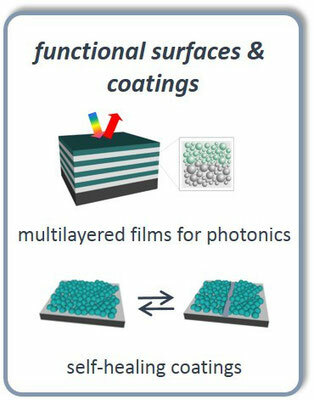 Ultimately, combining the power of self-organization with concepts from polymer- and organic chemistry, colloidal synthesis, surface patterning methods and the physics of interfaces offers a tremendous potential for the development of new meso-structured materials. Most importantly, the concept offers a high level of control, modularity and flexibility to tailor the structure at each independent length scale, which, when brought together permits control over the final material.